Sekonic is now presenting the world’s fastest reading OMR scanner with a speed of 11,000 sheets per hour. Sekonic SR11000 allows the user to process large volumes of OMR forms at maximum speed and designed with cutting-edge functions for reduced time, effort and money. 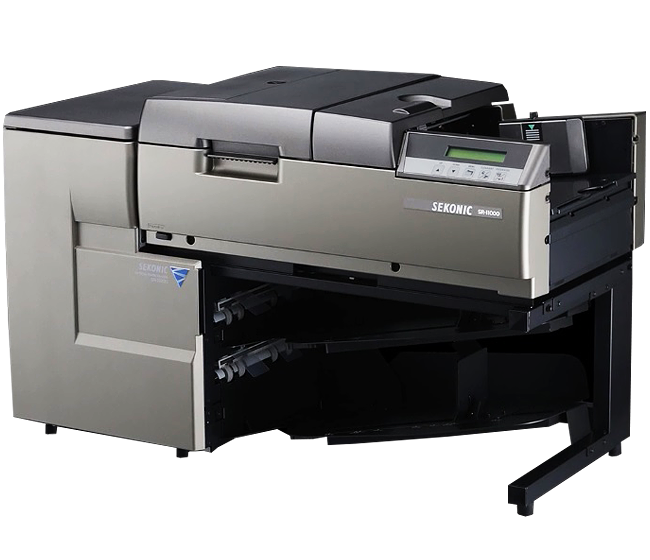 The SR-11000 has a reading accuracy of 99.99% while offering the world1s fastest reading speed of 11,000 sheets per hour. This high level of performance is enabled by combining several mechanisms that incorporate SEKONIC's optical technology and mechatronics. The high reliability and usability of the SR-11000 significantly improve the efficiency of OMR sheet processing. Mark Shapes Rectangle, Oval and Circles. New Prism Position Sensors that constantly monitor high speed feeding. The SR-11000 has 11 position sensors, including the new Prism Position Sensors, which precisely monitor the paper handling. The sensors constantly monitor the sheets as they are being fed at high speed to ensure precise feeding. If a feed error is detected during operation, sheet feeding is immediately stopped to avoid or reduce damage to the following OMR sheets. The SR-11000 has a USB 2.0 (High Speed) interface. The processing speed can be increased by configuring a distributed network with multiple SR-11000 units. By using two SR-11000 units, for example, you can process 22,000 sheets per hour, twice the number that is possible with one unit. This would be useful when there is a need to process very large volumes of sheets in a short time or when processing OMR sheets during the busiest times of the year. Even a mixture of different types of OMR sheets" can be read based on individual mark rules and then output as distinct data. *Sheets must be of the same size and use the same mark pitch. The bnilt-in ink-jet printer prints information, such as consecutive numbering or dates, on each sheet. The printing position can be easily adjusted with the indicator. This greatly reduces the time needed for sorting processed sheets. Our unique advanced paper handling technology provides stable sheet feeding and handling, even at ultra-high processing speeds of 183 sheets per minute. Our precisely designed misread prevention system is incorporated into the SR-11000. 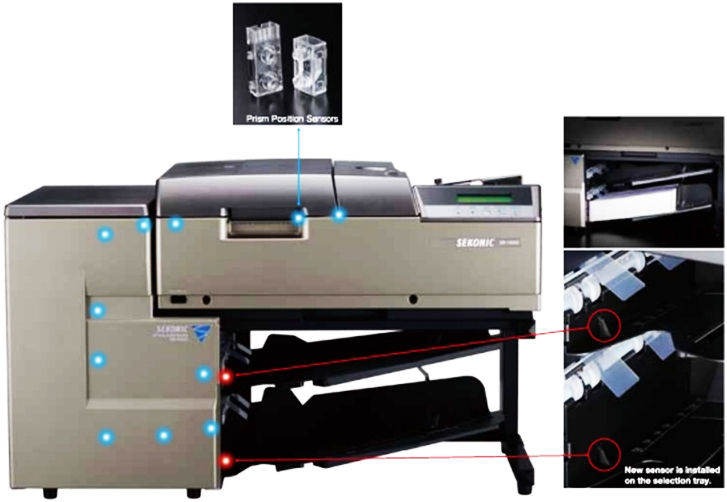 The new system can suction up materials, such as eraser shavings, sheet dust, and dirt, which can cause read errors, before the sheets reach the mark reading sensor. The bnilt-in ink-jet printer prints information, such as consecutive numbering or dates, on each sheet. The printing position can be easily adjusted with the indicator. This greatly reduces the time needed for sorting processed sheets..
With the sheet loading system, you can prepare and load large numbers of OMR sheets at one time - up to 500 sheets - in the OMR sheet loading table (hopper) for processing as soon as the current batch of OMR sheets has been processed. Our precisely designed misread prevention system is incorporated into the sr-11000. The new system can suction up material , such as eraser shavings, sheet dust, and dirt, which can cause read error, before the sheets reach the mark reading sensor. 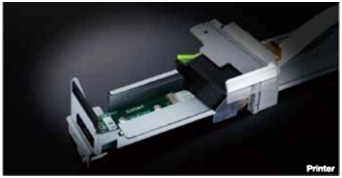 This new mechanism greatly reduces the number of cleaning cycles needed for the reading sensors,thus minimizing maintenance effort and cost.